While best known as an auto dealer, Pioneer Award-Winner, the late Ernie Boch, also owned four Cape Cod radio stations. Adapted from the Boston Herald, July 15, 2003: Ernest J. “Ernie” Boch Sr., the windshield-smashing, price-slashing, llama-pasturing sultan of Bay State auto sales, died of liver cancer Sunday night at his majestic 15-acre estate in Edgartown. He was 77 – or perhaps 75, according to his son and successor, Ernie Jr., who cited conflicting dates on family birth certificates. But whatever Mr. Boch’s age, friends, family and competitors said yesterday, the Norwood-born mastermind of the Auto Mile was like a vintage sports car: revved up and un-retiring until the final hours of his long, hugely prosperous life. It wasn’t long before his Rambler dealership outstripped the rest and the idea of the Norwood Auto Mile took hold. By 1971, Mr. Boch recalled, he was selling Dodge and Oldsmobile, Toyota and finally Subaru – the car he helped make into a New England staple. “He had this great gift of vision,” Ernie Jr. said. “With Subaru and Toyota and other Japanese cars, he knew what was coming down the pike before it was even on the pike. 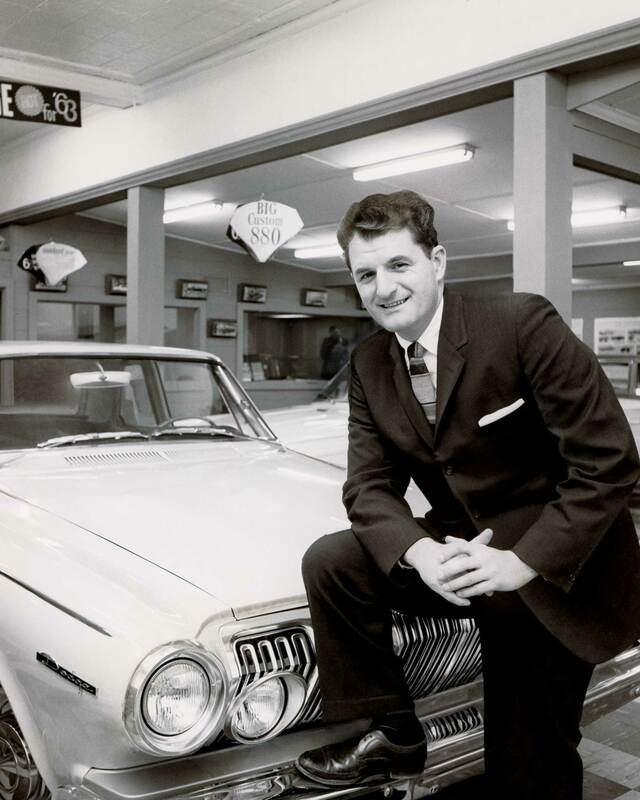 He could see into the future.” By the late 1980s, Mr. Boch was the king of the Auto Mile, [and] his half-million-dollar annual advertising budget … guaranteed that car buyers indeed “came on down” to Norwood. Mr. Boch’s charitable work included donating $3.1 million to the Boch Center for the Performing Arts in Mashpee and donations to Norwood Hospital’s cardiac unit, Camp Jabberwocky, a Vineyard camp for children with cerebral palsy and others.